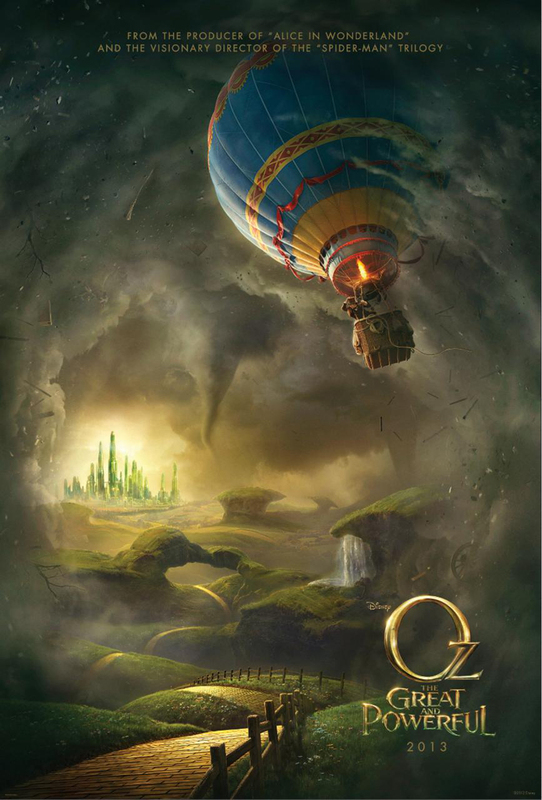 "Oz: The Great And Powerful"
The second best news about “Oz: The Great And Powerful” – whose first teaser-poster just debuted – is that Sam Raimi is directing it, and it re-teams him with James Franco (in the lead role) and composer Danny Elfman. The Elfman connection is especially noteworthy, as he and Raimi (previously longtime buddies) supposedly had some kind of falling-out a few years back but apparently have patched things up a bit, which is very cool. Frank L. Baum’s “Oz” books (which get really, reeeeaaaallllllyyyyy bizzare pretty quick after the one everyone is familiar with) are in the public domain (or are they not anymore?) and everyone in Hollywood is suddenly hot to get Oz prequel/spinoff/reboot projects of their own off the ground in a mad dash to beat the innevitable movie version of “Wicked” to the screen. Along with this there’s also a “Return to Oz”-style sequel cooking at Warner Bros., a CGI feature tied to John Boorman, a franchise-starter non-music remake of “Wizard” and several others in various stages of pitch/sale/greenlight. In addition, Anne Hathaway is attached to an Oscar-buzzy Judy Garland biopic that deals heavily with her turn in the original movie. Escape to the Movies: "Untangling Spider-Man"
John Boorman? THAT John Boorman? The last time he did a project thematically based on the Wizard of Oz it was, um, Zardoz. I'm surprised you didn't comment on the “visionary director of the Spider-Man trilogy” and how it basically says “yeah, that new movie ain't worth a dollar”. Anyway, I'd be kind of concerned about the Disney connection because I get the feeling they're basically “done” with the public domain. My completely-unfounded pet theory on why they relegated John Carter into tax write-off territory is because it's based on a public domain series. Disney is, if nothing else, extremely territorial about copyright and they probably realized around the time of The Asylum's adaptation that they could do very little to stifle direct competition. Since buying Marvel has basically ensured they have at least half a decade of the current hot thing left to make their billions, anyone want to bet they decide to write this one off as well? Oh Lordy. Someone's letting Boorman have another go at this? I don't know about you, but I personally hope it is fully Zardoz's equal for sheer lunacy. You just don't get that kind of crazy anymore. It's L Frank Baum, not Frank L Baum. Bob, it's horrible-somebody made a “Beat up Anita Sarkessian” thing on newgrounds yesterday!